We’ve kind of settled into something of a routine now and I think we’re now all getting a decent night’s sleep again. Sandy and Jennifer were the early birds this morning and elected to get up and active whilst Joey and me continued to snooze some more. Well, it ‘is’ a holiday after all, right? We’ve stuck with the same sleeping arrangements of Sandy and Joey in the same bed together and me and Jennifer in the same bed together, as this seems to work well for us. We discovered early on that keeping the kids in separate beds was the key to a swift bedtime settling down routine. Having the iPads for a late night movie has also helped quite a bit. Indeed, we’ve made very good use of all our electronic paraphernalia since we arrived and this has, I think, justified all the additional baggage by way of chargers, cables and the like. Sandy and Jennifer spent their pre-breakfast waking hours down by the pool. Joey and me had finally roused by around 09:00 and we met the girls down there just as they were finishing up to come and collect us. We made our way over to the main breakfast buffet hall and were seated at the table next to last night’s. This, of course, brought all the fabulous memories of last night’s serenade back to us. What I had forgotten to mention in yesterday’s journal was that following the wonderful serenading, each and every staff member made their way around our table and gave everyone either a hand-shake or a cuddle - a really nice touch. Sandy seems to think that, for whatever reason, our family seems to have been singled out for special treatment, but I rather think that this is all genuinely part of the Fijian warmth and that our willingness to just accept the hospitality at face value automatically makes for very pleasant interactions with the staff. I’ve overheard other people here complaining about the expense of the place and how every opportunity to entice guests to part with their money seems to be grabbed by the resort operator, and that’s certainly a position that you could take if you were so inclined. In our case, we’ve effectively given in to the fact that we’re in a 5-star resort and that things are going to cost a little more money. ￼Yes, to a certain extent, we’re paying through the nose but the flip side of that coin is that we’re truly getting very good service and a fantastic experience for our money in return. The ‘extra’ that we’re paying is getting us ‘extra’ in return. Having made peace with that point of view, and having budgeted for it accordingly, we’re able to simply sit back, relax and enjoy the whole experience unashamedly. Let the other people complain if they must. I’m going to enjoy myself while it lasts. Speaking of good service, we had brought the laptop with us down to the breakfast hall so as to upload yesterday’s journal entry and some photos. As Sandy was sifting through her Facebook timeline, she struck up a conversation with one of the waitresses. After a while, the two of them agreed to exchange contact details and then we mentioned that we were planning on walking the kids over to the kids club. The waitress then insisted that we stay seated whilst she took the kids over there herself. And so Sandy and I were suddenly relived of our child-minding duties and were able to finish off breakfast at a relaxed pace. How’s ‘that‘ for service? With the kids merrily having a good time at the kids club (again), Sandy and me once again uncharacteristically found ourselves with some time on our hands together. We had heard about a train ride and wanted to know more so we made our way over to guest services area next to the main reception desk to see what information we could get. There are a couple of different train rides but the one that would have been the better of the two options is not currently in service. I was somewhat tempted by the ‘diving with sharks’ trip that the woman was telling us about after learning that we were certified divers. I think this is the same dive that my dive buddy from yesterday was also telling me about. It seems like an opportunity I should avail myself of but, on the other hand, I find myself somewhat conflicted about the whole idea too, because the dive operator entices the sharks by feeding them. ￼There are all sorts of moral objections that could be rendered against this practice. On the other hand, it is a respectable operation that has been in place for over twenty years already, and there are likely to be very limited chances for me to ever get to swim with sharks in their natural habitat - other than the odd fleeting glance at one passing by that I might happen to see on a regular dive. I’m still mulling this one over in my mind. I might speak to the Gary tomorrow about this to get his take on it before deciding one way or the other. Moral issues aside, the fact that I have no functional underwater photography equipment, and thus will be unable to bring back photos of the experience, is also weighing heavily on my mind. Having left the information desk with a small handful of leaflets, we decided to next take a stroll along the coral beach. With some scattered cloud about, I would guess that it’s about 30 degrees Celsius in the direct sunlight. We’ve all been ensuring to keep ourselves fully sun-screened and it was a lovely walk with the tide mostly out, leaving the pristinely clear lagoon itself no more than a meter or so deep so far as we could tell. I did try walking barefoot in the water for a bit but the hard and sharp coral that makes up much of the beach is difficult to walk on barefoot and cannot easily be avoided. From time to time, we’d spot some marine life and did our best to take some snaps. Between colourful fish, long sea cucumbers and a couple of blue sea stars, it was a thoroughly enjoyable stroll. We did have one brief cause for concern, when we realised that we were walking past a group of small children sitting a few meters away from the water’s edge beneath a retaining wall. ￼This turned out to be the kids club on an excursion - with Joey & Jennifer sitting there with the other kids merrily having fun doing whatever it was that they were doing. The cause for concern was the very real danger that both kids would see us and decide to want to join us. Somewhat mischievously, we decided to just keep our heads down and carry on walking as if we’d not seen them. The ploy worked and I think we were fifty meters or so beyond them before we noticed Jennifer waving at us. We waved back and she carried on playing again. Clearly, they are enjoying their time in the kids club - as are we. The Outrigger On The Lagoon is just one of many resorts, hotels and such up and down the coral coast and we walked past some of them as we strolled. There was an outfit offering horse-riding, a couple of restaurants and a hotel/spa complex, which we wandered into to have a peek at their prices for spa treatments. They are cheaper to be sure but don’t have the same presence and surroundings as does the Outrigger’s Bebe spa complex. 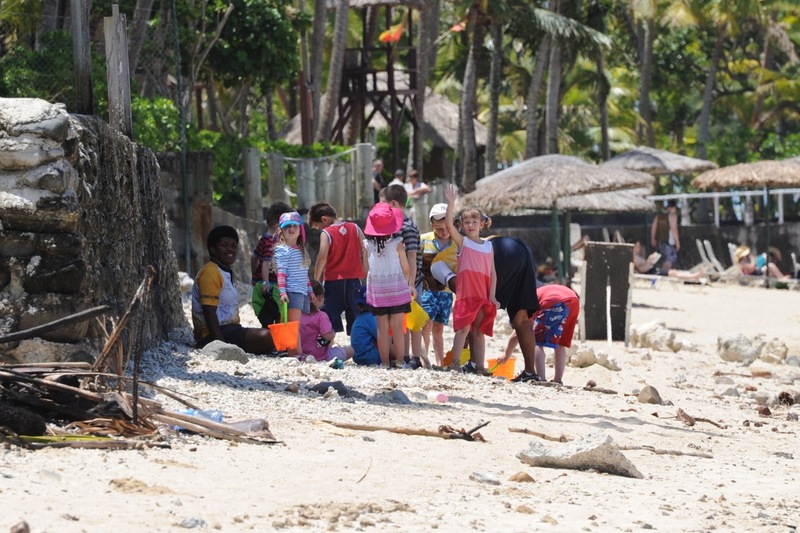 We were by now nearing the time to collect the kids from this morning’s kids club session and so we made our way slowly back along the beach to the Outrigger again. After collecting the kids, we took them over to the kids lunch buffet station but, just as yesterday, couldn’t get them to really eat very much. Sandy often fusses about such things but I’m more from the school of thought that says that the kids will eat when they are hungry enough. Sandy and I often agree to disagree on this. In her defence, Sandy will often claim that it is her and not me that has to deal with the fallout of a hungry child early in the morning or late at night. She does have a point. Sandy and me didn’t bother with lunch today but I was able to book us a reservation for 2 for tonight (and also tomorrow night) for 20:00 at the Sundowner restaurant. We’re anticipating that the kids will be in the kids club for the 3rd of the 3 daily sessions today (and tomorrow) and so will have the opportunity to enjoy a relaxing meal just by ourselves. Whilst I was over there, I nipped into the dive shop underneath the restaurant to ask about tomorrow’s night dive and whether they will have a main dive torch for me to use (I only brought a smaller reserve torch with me). Whilst I was there, they confirmed that my total of 6 dives (2 from yesterday, 2 tomorrow and the 2 night dives) including all gear rental would tally up to $780 Fijian Dollars. This came in below my allotted budget and so I was quite happy with this. ￼In the meantime, we all spent another hour or so after lunch at the pool again - complete with inflatables and general good humour. This lasted an hour or so up until the start of the second kids club session of the day Sandy took Jennifer over to sign her in already whilst Joey was happy to spend another half hour or so with me at the pool playing with some kids that he had struck up an impromptu play date with. I’ve since taken him over to sign him in and have spent the past half an hour or so relaxing on this lounger whilst writing up this journal entry up to this point. The thatched parasol has kept the sunlight off of me and it’s been quite a relaxing half hour. I may yet lower the lounger and simply nod off for a bit in the warmth of the Fijian sunshine. See you later. Ok, well I set my alarm for 15:50 in the full knowledge that there was every chance that I would doze off - which I did. Dozing on the flattened lounger under the warm but not too intense sun was very nice indeed. I dare say that Sandy was enjoying her spa treatment every bit as much and then some. I’ll find out later - if and when she re-surfaces. I did my best to rouse myself from my semi-unconscious state and wandered over the 30 meters or so to the kids club to pick up the children. Uncharacteristically, I was now the only responsible adult on duty for the kids and so I had to figure out what and how to feed them and what to do to take care of them. I would get, it would seem, a sense of what Sandy’s life is like. Well, let’s be honest here for a second or two. All I actually had to do was to feed the kids once between kids club sessions and I would have them for just 2 hours. Still, it seemed like a daunting enough of a challenge for me but I felt I was up to it nevertheless. ￼So, to feed the kids, then. What could be difficult about that? Ok, this is easy. Dotted around the poolside are tables and chairs in addition to the loungers. There are waiters and waitresses wandering around to whom you can ask for pretty much anything from any of the various restaurant menus. Affixed to the table parasols are little shelves with menus in them so I plucked one of the kids’ menus for the poolside restaurant out of it’s slot and went through all the items one-by-one to see what the kids wanted. Jennifer was easy. She’s had spaghetti with meat sauce several times already and I barely got the name out before she latched onto that idea. Joey, on the other hand, was a different story altogether. It didn’t seem to matter how I spun it, nothing on the menu - indeed nothing I could think of that could reasonably be disguised as one of the available menu items - was acceptable. Alas, Joey, once he’s set his mind on something, cannot be swayed one way or the other. After quite some negotiation, I finally pried out of him the word ‘waffle’. Well, there are simply no waffles on the menu so that’s just not going to happen. No, he had decided that that was all that he was going to eat. Ok, what to do now? I don’t have the same prowess of persuasion that Sandy does with Joey and I didn’t want to force the issue and create another meltdown. It is, after all, the kids’ holiday too and I wanted to do whatever I reasonably could to accommodate their wants and needs during this holiday. Ok, so what to do now? First up, I asked one of the passing waitresses whether it would be possible to order something that wasn’t on the menu. The woman that I had snagged was a young lady and I think she was a bit taken by surprise by the question and she very politely told me that she didn’t think it was possible. However, to her credit, she did say she would go and ask the poolside restaurant chef. Alas, she came back shortly thereafter and said that they don’t have the equipment for making waffles. Fair enough, I thought. Now, Joey had a waffle for breakfast this morning but that was over at the main buffet restaurant, the Vale Ni Kane, and so I thought I might have better luck trying there instead. I asked the waitress with whom I had just been dealing if she could take me over to the Vale Ni Kane restaurant to introduce me to the duty manager, which she was more than happy to do - after her initial surprise that this request had sunk in. Although I’m not entirely happy with myself for doing so, I decided that I needed to pull out the autism card and play it. ‘Bugger it’, I said to myself internally. Autism, as I’ve been told on several occasions by various professionals, is kind of like pregnancy in that you either have it or you don’t. There’s no such thing as being ‘a little bit autistic’ (or being ‘a little bit pregnant’). You either have it or you don’t. If we’re in for a penny, then we’re in for a pound, I thought, so I told the duty manager that I had an autistic child and that we occasionally have problems like this and whether they could organise a waffle for him since he’s decided that this is the only thing he’ll eat. Well, this created quite a bit of Fijian discussion between several of the restaurant staff before the head chef, no less, was eventually summonsed. ￼I explained the same to him and he pondered for a few seconds before saying ‘yes, we do make waffles but I will have to check to see if we have any of the waffle mix ready’. With that, he ordered something in Fijian to an underling that was with him and he said he would come back in a moment to let me know. There was more Fijian discussion amongst the staff for the next few minutes as I waited and I felt quite conscious about being the centre of this attention (at least, that’s what it felt like at the time). Sure enough, a minute or two later, the head chef came back and said ‘Yes, Mr. Morgan, we have the mix and Joey’s waffle will be ready in 5-7 minutes’. For the past couple of days, I’ve been wondering in the back of my mind just whether I might find a chink in the customer service armour in light of how extremely well we’ve been treated here at the Outrigger sp far. Well, it clearly isn’t going to be today. In the meantime, the remainder of the meal that I had ordered for Jennifer, in addition to a bowl of chips for Joey, had emerged from the poolside restaurant and they both duly tucked into their food. About 5 minutes later, the head chef himself emerged from the Vale Ni Kane restaurant carrying a plate with a waffle on it for Joey. I felt so relieved. As he approached closer, however, I saw something that shook me to the bone and sent me cringing. Instead of the plane waffle that I had assumed would come out, the chef had added blueberries and maple syrup - which Joey doesn’t like - over the entire waffle. Disaster. Not only was I worried that this meant that Joey would not eat anything substantial after all but worse than that, I had visions of him turning his nose up and it and proclaiming - in front of the head chef - something like ‘I don’t like that’. What would that have made me look like, I wondered (feared more like). As the head chef laid the plate onto the table, I was on pins and needles, scared witless of what Joey might now blurt out. As luck would have it, he said nothing - at least until the head chef left. Then it came. ‘I don’t like maple syrup Daddy’. Ok, into ‘Dad to the rescue’ mode again now. ‘No worries, Joey, I’ll turn it over’, which I thought was a brilliant strategy on my part with so little time to think. I was internally congratulating myself on my ingenuity for this off-the-cuff tactic right up until the point that I realised that the syrup was all over the underside the waffle too. Hmmm. No way out of this now, and I’m pretty much committed as it is. I cut a small piece that had the least maple syrup on it off and just thrust it into his mouth. To my absolute astonishment, he simply took it and merrily started to eat it without fuss. Hmmm. I cut off another piece and gave it to him. This time, I couldn’t avoid selecting a piece that had a little maple syrup but I simply had no way out. Then, mid chew, he seemed to have a revelation and blurted out ‘Daddy, I do like maple syrup after all’. Bloody kids. As the kids were feasting on their meals that I had hard fought and courageously to provide for them, I struck up a conversation with the couple on the next table. We’d seen them repeatedly over the past few days, as they, like us, have tended to park themselves in the same spot by the kiddies area of the pool each day. Their kids and ours, as is the case with many of the kids fleeting around the place, are on a first name basis. It turns out that this family of four comes from Cranbourne, which is just a stones throw from where we live in Melbourne. What a small world. Actually, the vast majority of the guests at the Outrigger, which is owned by an Australian company, are either from New Zealand or Australia. These are the two major markets that Fiji caters for as a holiday destination. With my roaring success of organising dinner for the kids now fading into memory, I took the kids back to the bure for half an hour to freshen up a bit with a change of clothes ahead of dropping them off at the kids club for the evening session. When we got there, the Talai butler (maid) had just arrived to bring us our nightly, complimentary Champagne and liqueurs. Like most of the staff we’ve encountered, she knew both kids by their first names and asked if there was anything she could do to make our stay more comfortable. It doesn’t matter who we encounter here, nothing seems to be too much bother for anyone and everyone seems to be going out of their way to appease us. What a fantastic place it is here - and that from someone that is a self-confessed ‘difficult customer to please’. When I got to the kids club area, there was nobody there. Apparently, today’s evening session was to start at the Vale Ni Kane restaurant so we wandered over there. Possibly because of this slight change in routing, I’m not sure, but Joey seemed particularly clingy. Emma, the waitress that organised the birthday and anniversary serenades yesterday was there and she was asking me if there was anything she could do for us so I said yes and asked if she could distract the kids so that I could take my leave. Much as she tried, Joey really didn’t want to let go and it wasn’t until one of the kids club staff picked up on this and decided to take him by the hand to ‘go and see the fish’ that I was finally able to separate myself from him. Taking Joey by the hand has proven to be a very powerful tactic in our arsenal for dealing with him - particularly when he is being stubborn. Very often, all it takes is just offering to take his hand and he’ll happily comply with going wherever you want him to go - even if you’ve just spent the last 5 minutes trying to convince him to go somewhere he didn’t want to go. Offering Joey either a hand or a cuddle are the two most powerful weapons in our arsenal. With a few moments on my hand until Sandy’s anticipated emergence from the spa, I had myself a quick shower and just chilled out on the bed for a bit before picking up the laptop to fill that void by doing some journal writing. I wasn’t at it for more than half an hour before Sandy did finally show up and she seemed duly refreshed and content from her relaxing spa treatment. I continued my writing and Sandy pottered around a bit before declaring that she was restless, so we decided to see if we could get our table at the Sundowners a little earlier than we had booked. Fortunately, that wasn’t a problem and they sat us at a nice spot overlooking the ocean. We both ordered the eye-fillet and it was cooked to absolute divine perfection. It was a very relaxing meal and we actually had time to just chat, which was nice. In actual fact, we mostly chatted about strategies for dealing with Joey, what works and what doesn’t. Towards the end of our stay, the staff gathered around a couple of nearby tables and started serenading a couple of couples. It was evidently these couples’ last night here at the resort and they were being treated to the ‘so long’ goodbye song. It sounded lovely and was clearly very well received. As it was getting very close to us needing to collect the kids, we decided to forego desert and made our exit. The meal came to $154 Fijian Dollars. On the way over to the kids club, we had to navigate through a crowd of people being entertained by a compare who was ‘auctioning’ frogs for a frog race. We didn’t stay long enough to figure out anything more than that. When we reached the kids club, we found only a few kids there and neither of ours were among them. Apparently, the ‘Little Riggers’ kids (the kids club has 3 levels based on ages and both ours fall into the Little Riggers category) were due back shortly from their own frog racing event over by the tennis courts. Within a couple of minutes, we could hear their procession coming down one of the paths. All the kids were in pairs and holding hands with their ‘best friends’. Jennifer was clearly upset and almost in tears. It turns out that she was upset and didn’t want to ‘touch’ the frogs but both Sandy and I recognised straight away that the problem was simply that she was overly tired. With that, we made our way swiftly back to bure and we all settled equally swiftly into our beds. Today was another good day for us here in Fiji.